There are two soups that I will always order on a menu when the craving hits. French onion soup and mushroom soup. Homemade of course. Nothing beats the flavour, texture and freshness of homemade soup. Oh, and did I mention most soup is tremendously easy to make? You heard it here first. No word of a lie, most soups are roasted veggies, tossed in stock with a plethora of herbs, cooked, then pureed. That's it! So, when I stumbled upon yet another Smitten Kitchen Instagram post that was titled, Balthazar's Cream of Mushroom Soup, my mouth started to water. Profusely. I've been to Balthazar's on several occasions because its one of my favourite NYC restaurants. Mix that with a dreamy, creamy, homemade mushroom soup recipe and you have magic. Perfection. I was 2 coffees deep on that Tuesday morning, but my day was made. I had to cook it that night for dinner and boy did I do just that. Let's just say it was devoured in about 36 hours and that served us both for 1 dinner (2 helpings) and 2 days of leftovers. It lasted longer than I thought, but lets just say I will be cooking this soup again. In true Andrea form, if you haven't stumbled upon this recipe already, I'm sharing it with you today. 1. 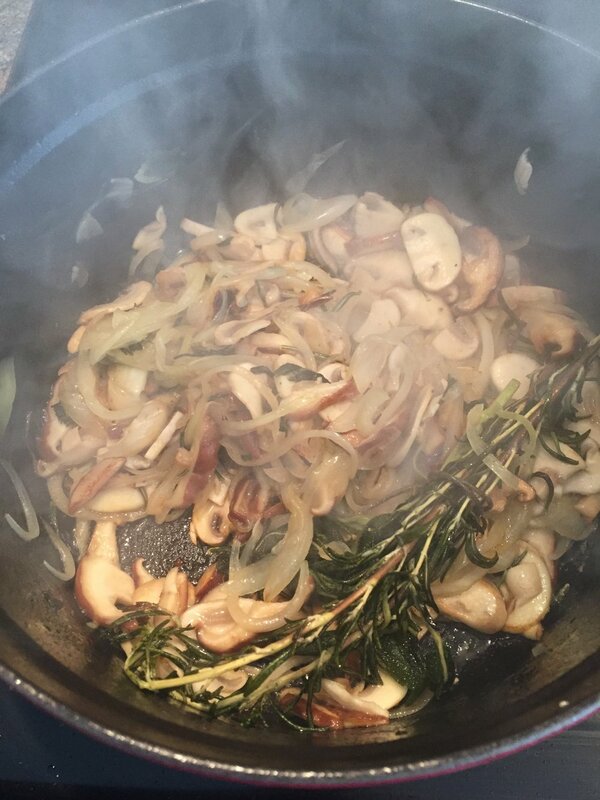 Soak the dry mushrooms in 1 cup of warm water for 20 to 30 minutes, until plump. 2. Strain the soaking liquid through a coffee filter or strainer to remove grit and reserve, along with the reconstituted mushrooms, until needed. 3. Heat the olive oil in a large pot over a medium flame. Bundle the rosemary and sage together and tie with kitchen twine. When the oil is hot, add the herb bundle and sizzle for a few minutes on both sides to infuse the oil. 4. Add the onion, garlic, salt and pepper and cook for 5 minutes, until the onion is soft and translucent but not brown. 5. Turn the flame to high and add the white mushrooms and shitakes. 6. Cook for 10 minutes, during which the mushrooms will give off their liquid (which should evaporate quickly due to the high heat) and deflate significantly. Stir occasionally. 7. Add the chicken stock and the dried mushrooms along with the soaking water. 8. Simmer for 30 minutes. Remove the herbs, then add the cream and butter. Working in batches, puree the soup in a blender until smooth (I used an immersion blender which is far easier). Return to the pot and keep at a very low simmer until ready to serve.